Thanks to globalization and the Internet age, young people are growing up in a world that is more interconnected than ever. Despite all this connectivity, there are still millions of people around the world whose lives remain invisible and marginalized. As educators it is our responsibility to help students understand how they can act as global citizens and advance universal equality. Given the humanitarian issues facing the international community, these lessons are critical and we must find ways to help empower Canadian youth to become agents of change. Every year Balmoral Hall’s student service group supports a social justice cause. This year the group decided to sign up for Plan International Canada’s “Spread the Net Student Challenge,” a friendly competition between Canadian schools to raise funds for malaria-preventing bed nets for families in Africa. This challenge was about much more than vying for bragging rights—it was a learning experience which has had a lasting impact on our students in diverse and unexpected ways. 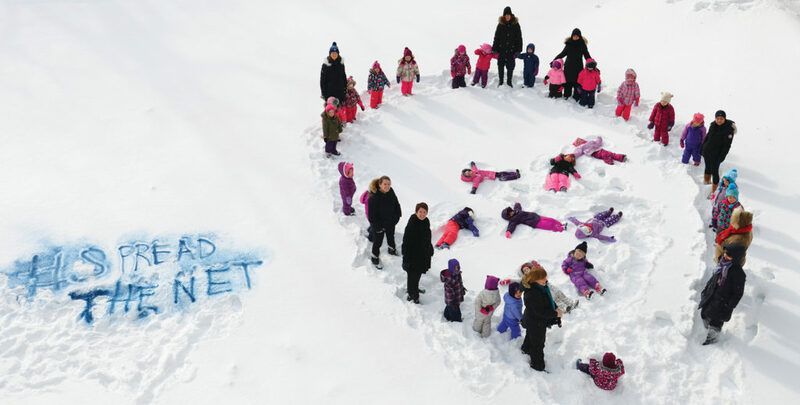 Young Balmoral Hall students create a human “net” around “mosquitoes” in the snow, helping to bring the issue to life. 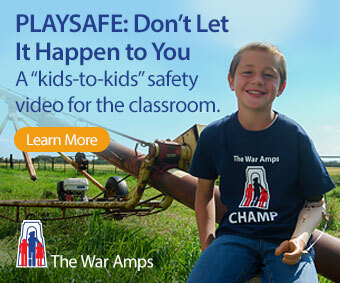 Spread the Net is all about kids helping kids. Malaria is the number one killer of children in Africa, a fact that resonates with students and allows them to connect to the issue on a personal level. Our students at Balmoral Hall are no strangers to mosquitoes, the pests that spread malaria in Africa. Winnipeg has a reputation as the mosquito capital of Canada, and identifying a common enemy made the issue even more relatable. Our students learn about international development and social justice issues in the classroom, but Spread the Net empowered them to raise their voices and take action to tackle a real problem. This drive to effect change remained at the heart of all of our activities. Our school has students from all around the world, some of whom have lived in areas where malaria is a very real threat. It was important that students understood that the goal of our participation in Spread the Net was not simply to raise funds, but also to raise awareness. Even though our school ranges from childcare to grade 12, we created fun, interactive and meaningful activities that the entire student body was able to participate in. It can be difficult to engage young children in complex global issues, but the student service group was committed to including everyone at Balmoral Hall, ensuring it was truly a collective effort. The youngest students created a human “net” around a group of little “mosquitoes” in the snow, showing how important bed nets are to preventing malaria. By taking this inclusive approach, our small school of just 500 students was able to raise $12,000. Throughout the process, I was inspired most by the level of involvement from our entire Balmoral Hall community. Our alumnae community was especially active, with everyone from some of our oldest alumna to our recent graduates donating to the project. Parents were also motivated to take action, matching earnings from a student-led toonie drive. The faculty and staff even threw their hat into the ring by hosting a huge bake-sale (an activity typically reserved for students). Together the entire community rallied behind the challenge, cultivating a collaborative environment. This experience turned out to be a fantastic exercise in leadership building—particularly for our senior students. Our Global Issues Prefect, Sara, championed the challenge from start to finish, learning invaluable lessons in volunteerism, organization and critical thinking. She not only engaged students and staff but also alumnae and members of the wider community. Through Spread the Net’s online fundraising platform, she was able to communicate with donors and send regular updates—gaining real-life experience in professional relationship-building and communication. She met the challenge head-on, and emerged with confidence and resilience. 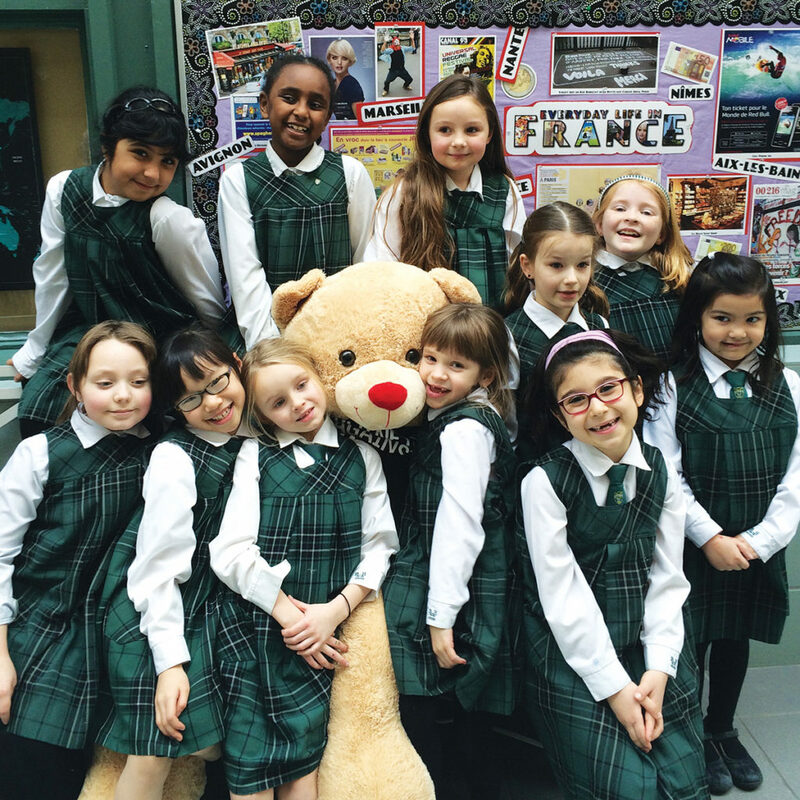 Balmoral Hall students pose with the “Spread the Net” bear, which was auctioned off in the “Hug-A-Bear” fundraiser. Spread the Net is an adaptable fundraiser with lots of room for imagination. It inspired us to stretch our creative muscles and to brainstorm innovative ways to motivate people to give. The flexibility of the challenge allowed us to come up with ideas that were exciting, easy to execute, and worked with the teachers’ busy schedules. My personal favourite was the “Hug a Bear” fundraiser for which we raffled off tickets to win a giant stuffed bear. A teacher had the winning ticket so we purchased another bear to give to the runner-up, a delighted grade one student. The bears became so popular with our students that we replaced the bear after the draw was over. It now sits outside the library proudly sporting a Spread the Net t-shirt and providing hugs to anyone who needs them. Thanks to the incredible efforts and enthusiasm of our entire student body and wider community, Balmoral Hall was the top fundraising school in Canada. As one of the winners of the 2016 Spread the Net Student Challenge, our students were thrilled to get a visit from Rick Mercer and a feature on an episode of the Rick Mercer Report. The day he visited our school was one of the most powerful moments of the entire challenge—and not because of the TV crew or his celebrity status. His passion, commitment and message of positivity inspired the students to continue to play an active role in tackling vital global issues like malaria. Every school should have the opportunity to hear this message, and I strongly encourage all schools to participate in Spread the Net. With dedication and hard work, your school could be among the 2017 Spread the Net Student Challenge winners! Lois McGill has been with Balmoral Hall School for 21 years, and has been the Director of Academics for the Junior Kindergarten to Grade 12 programs since 2012. Passionate about social justice and community building, Lois started a social justice group at Balmoral Hall ten years ago. What started as a small group with only a handful of students has since grown to fifty members. She has also led many service-learning trips with the senior students, which allow them to experience first-hand the importance of giving back and serving the community. An avid volunteer herself, Lois works with a local refugee support organization and has served as a team leader with Teachers Without Borders Canada (now named Education Beyond Borders).